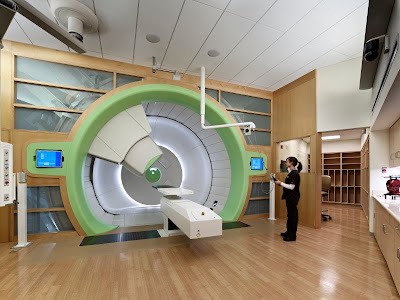 Proton therapy is a type of particle therapy where a beam of protons is used to irradiate diseased tissue. This new type of therapy is used in the treatment of cancer. The chief advantage of proton therapy is the ability to more precisely localize the radiation dosage when compared with other types of external beam radiotherapy. Backed by two new studies published in the January issue of the International Journal of Radiation Oncology•Biology•Physics (Red Journal), the American Society for Radiation Oncology's (ASTRO) official scientific journal, researchers are looking at this beam radiation therapy as safe and effective. During treatment, a particle accelerator is used to target the tumor with a beam of protons. These charged particles damage the DNA of the targeted cancer cells which either destroys it or negates its proliferation. Cancerous cells are particularly vulnerable to attacks on the cell's DNA because of its high rate of division and its reduced abilities to repair the damage to its DNA. Protons have little lateral side scatter in the tissue, Because of this the beam does not broaden much and stays focused on the target shape and delivers only low-dose side-effects to the surrounding tissue. All protons of a given energy have a certain range that very few protons penetrate beyond that distance. The dose delivered to tissue is maximum just over the last few millimeters of the particle’s range which is called the Bragg peak. To treat cancerous tumors at deeper levels, the proton particle accelerator must produce a proton beam with higher energy. Cancer tumors closer to the surface of the body are treated using protons with lower energy. The accelerators used for proton therapy typically produce protons with energies in the range of 70 to 250 MeV (Mega electron Volts or million electron Volts). By adjusting the energy of the protons during application of treatment, the cell damage due to the proton beam is maximized within the tumor itself. Tissues closer to the surface of the body than the tumor receive reduced radiation, and therefore reduced damage. Tissues deeper within the body receive very few protons so that the dosage becomes immeasurably small. In the first study, researchers at the University of Florida in Jacksonville, Fla., prospectively studied 211 men with low-, intermediate-, and high-risk prostate cancer. The men were treated with proton therapy, a specialized type of external beam radiation therapy that uses protons instead of X-rays. After a two year follow-up, the research team led by Nancy Mendenhall, MD, of the University of Florida Proton Therapy Institute, reported that the treatment was effective and that the gastrointestinal and genitourinary side effects were generally minimal. "This study is important because it will help set normal tissue guidelines in future trials," Dr. Mendenhall, said. In the second study, researchers from Massachusetts General Hospital in Boston, Loma Linda University Medical Center in Loma Linda, Calif., and the Radiation Therapy Oncology Group in Philadelphia performed a case-matched analysis comparing high-dose external beam radiation therapy using a combination of photons (X-rays) and protons with brachytherapy (radioactive seed implants). Over three years, 196 patients received the external beam treatments. Their data was compared to 203 men of similar stages who received brachytherapy over the same time period. Researchers then compared the biochemical failure rates (a statistical measure of whether the cancer relapses) and determined that men who received the proton/photon therapy had the same rate of recurrence as the men who received brachytherapy. "For men with prostate cancer, brachytherapy and external beam radiation therapy using photons and protons are both highly effective treatments with similar relapse rates," John J. Coen, MD, a radiation oncologist at Massachusetts General Hospital in Boston, said. "Based on this data, it is our belief that men with prostate cancer can reasonably choose either treatment for localized prostate cancer based on their own concerns about quality of life without fearing they are compromising their chance for a cure." ASTRO is the largest radiation oncology society in the world, with more than 10,000 members who specialize in treating patients with radiation therapies. As the leading organization in radiation oncology, biology and physics, the Society is dedicated to improving patient care through education, clinical practice, advancement of science and advocacy. For more information on radiation therapy, visit www.rtanswers.org. To learn more about ASTRO, visit www.astro.org.